Ahh, babies. It’s been a long time since I’ve had babies on the brain. Most of my peers had kids so long ago that they are now old enough to be productive members of society; but a month ago, one of my closest and dearest friends had a baby boy the day after my birthday! I cannot tell you how excited I am that a new baby has come into our little group of mostly child-free friends! I don’t have children of my own and that’s not entirely by choice. I struggled with infertility for many years before coming to the realization that one day my lady parts were going to become my undoing. That realization came in 2007 when I landed in the hospital with a collapsed lung caused by severe endometriosis. The following year, almost to the day, my lung spontaneously collapsed again. That time, I spent 6 grueling weeks in the hospital having 4 unsuccessful surgeries before finally heading to the Mayo Clinic for treatment. Remember when I mentioned my scars a few weeks back? That situation accounted for about 60% of them! I spent a week at the Mayo Clinic and they got me in good working order and I am forever grateful for that medical facility–they are nothing short of amazing! For the next 5 years, I tried to avoid the question of what to do about my fertility but once again, my body kind of chose for me. Between the endometriosis and then fibroids, my quality of life was declining, so last year, I bid adieu to my defective parts and gained a few extra scars. You should see me in a bikini! I now just tell people I was attacked by a shark! It was ultimately a good decision, but one made with the stark realization that I was closing the door on having children and assuming the permanent title of Aunt Tracey. And, you know, being Aunt Tracey isn’t so bad. I get to have all the baby-snuggling, play-doh buying and party-throwing fun, without the parent-teacher conferences and college funds! Here’s one thing that I know to be true about every party. 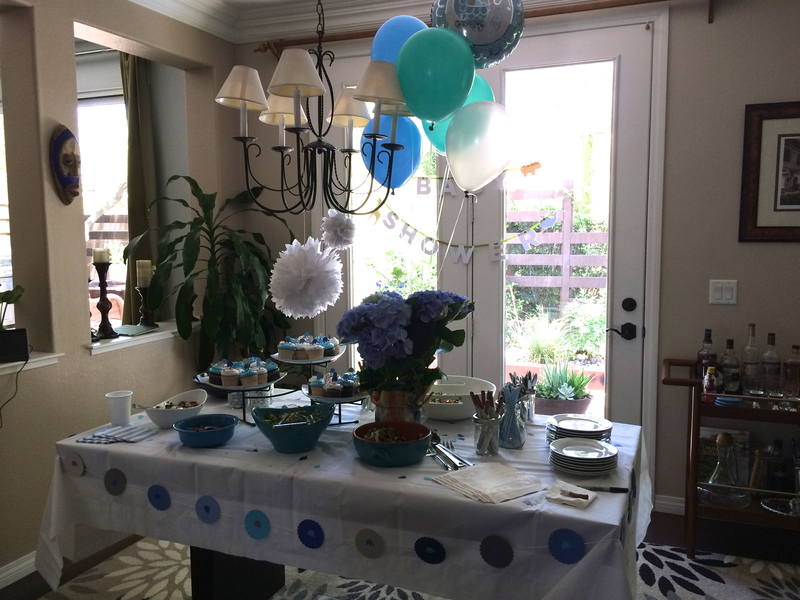 No matter how much planning and preparation goes into it, party day time is different than normal time. Party day time elapses at a speed that will make your head spin. This party was scheduled to begin at 11:00 a.m. and I swear, 9:00 to 11:00 went by in 10 minutes! 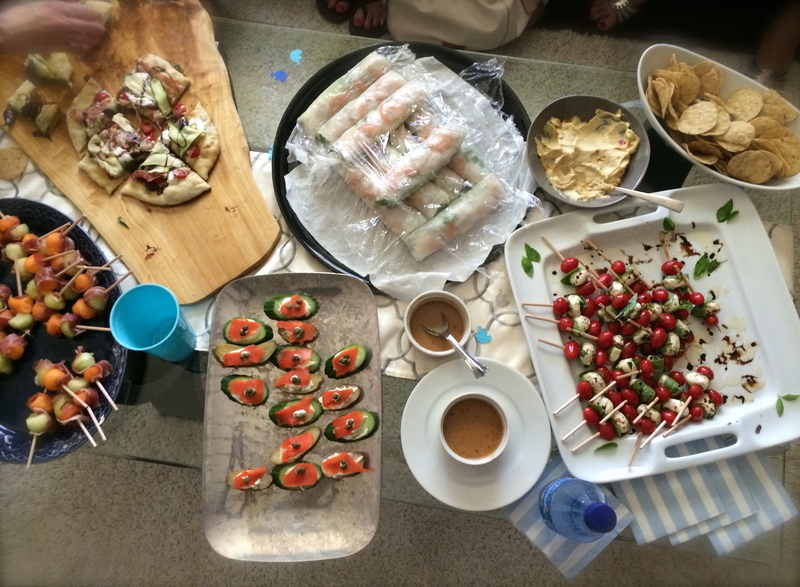 Thank goodness I had a lot of help from my friends who helped decorate and put together this amazing spread of appetizers! 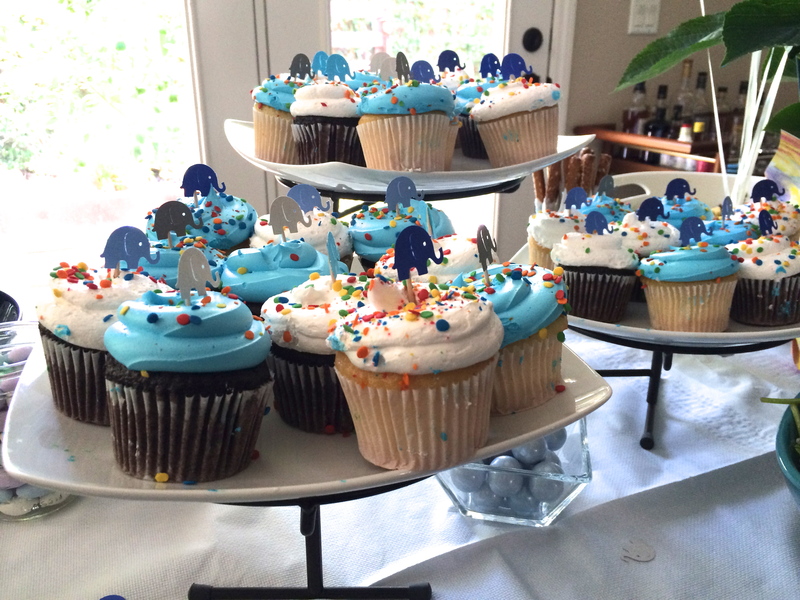 I did not make these cupcakes! But my awesome friend made the adorable elephant cut-outs! So cute! The theme of the menu was salads and flatbread pizzas and I was pleased that there was something for every dietary need–vegan, vegetarian, gluten free, omnivore–I think we had it all covered! 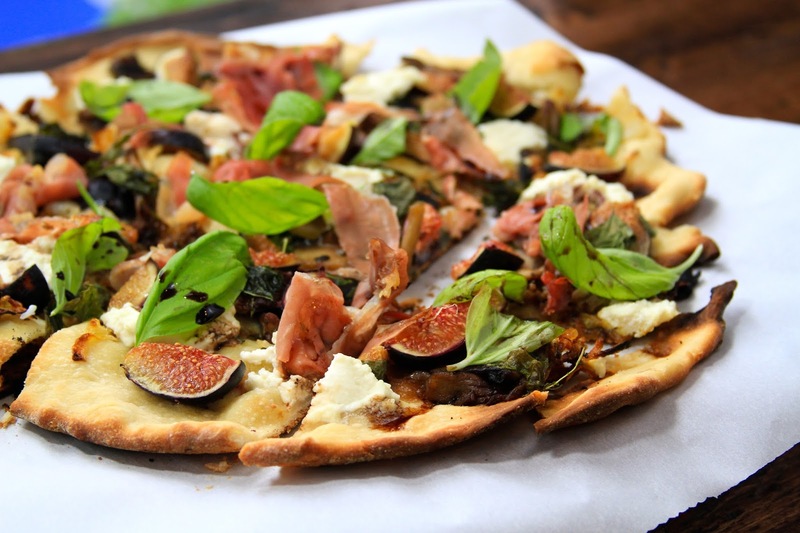 Over the next few weeks, I’ll be sharing a few of the newer dishes from this menu, but this Grilled Corn and Black Bean Salad was on the menu as well as this Fig and Prosciutto Flatbread Pizza. 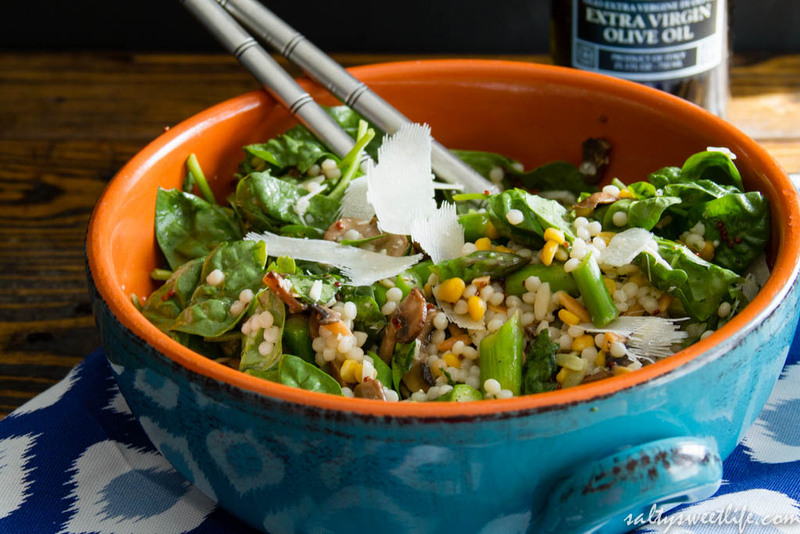 This Israeli Couscous, Asparagus and Mushroom salad was a big hit! I know this because there was only one tiny bowl of it left after the party was over! What I loved about this salad was that it could be assembled the night before without the dressing and quickly finished just before the guests arrived, which is great if you’re Aunt Tracey, who makes too much food and is pretty much going crazy making more and more dishes at the last minute. 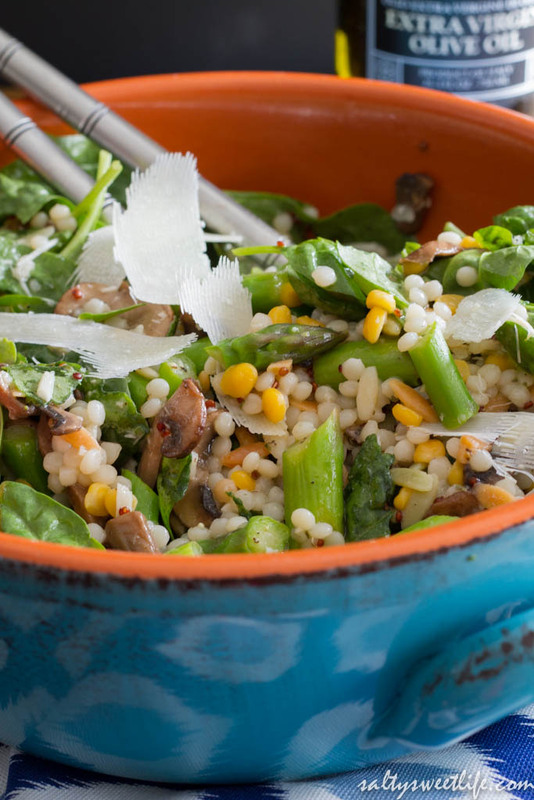 This salad is a playground of flavors and textures: bouncy, tender couscous, crisp-tender asparagus and crunchy spinach are balanced against the meaty umami of sautéed mushrooms. 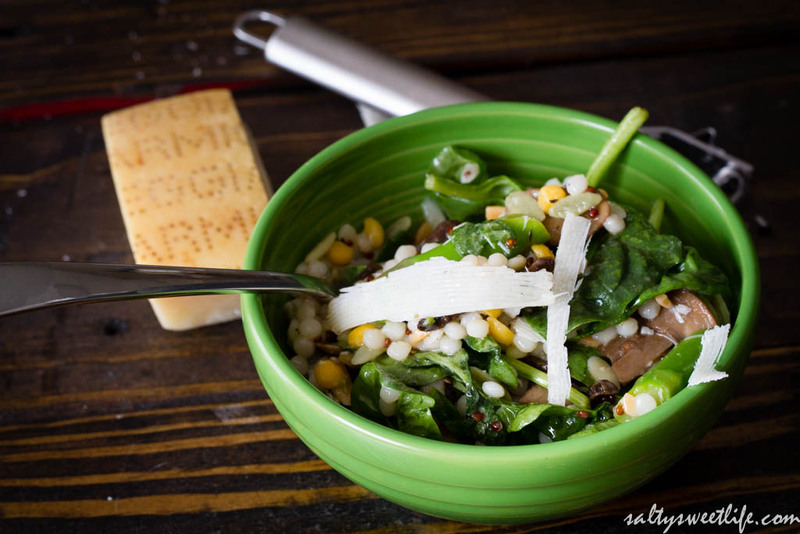 Salty Parmiggiano-Reggiano is tucked in throughout the salad and the whole thing is punctuated by a bright, tangy, red wine vinaigrette. It’s healthy and it’s filling without making you feel heavy. There are a few different components that are made separately, but I’m going to tell you how you can save a little time by changing your method for cooking grains! In the past, I’ve always made grains in my rice cooker or on the stovetop. Usually I would use a 2 parts water to one part grain ratio and cook it until the grain has absorbed all of the water. But, last year, my friend Alexandra, from Alexandra’s Kitchen who is also a big fan of grain salads, started talking about cooking grains in a big pot of water, just as you would when you boil pasta. The grains cook completely and retain their fluffiness in the salad and what’s more, it cooks in LESS time than the rice cooker or stovetop method. It’s foolproof. I’ve been using this method for quinoa and decided to apply the same method to the couscous for this salad, since Israeli Couscous is essentially a small, pearl-shaped pasta. I simply started a pot of water, threw in a generous pinch (more like a tablespoon) of salt and put the water on to boil. To save time, I blanched my asparagus for the salad in the boiling water, removed it and shocked it, then put the couscous right into the same boiling, salted water. I cooked it for 10 minutes, drained it with a fine mesh strainer and gave it a rinse with cold water. It worked perfectly! The couscous retained its shape and was well-seasoned by the salted water. Since I was making it ahead of time, I drizzled it with a little olive oil just to keep the grains from sticking together. I’m going to try it soon with farro and barley and I’ll report back on how it turns out, but I’m pretty confident that it will work. I actually used Trader Joe’s Harvest Grains Blend for this dish. It’s a blend of Israeli Couscous, quinoa, orzo, and garbanzo beans and I love all of the different textures of the grains! If you don’t have a Trader Joe’s near you, you can find Israeli Couscous in the grocery store located near the rice. The party was a blast. Everyone had a great time and left with full bellies and to-go containers! I got to honor my best friend and her new little guy. Food, friends and family. It’s what it’s all about. I am Aunt Tracey. And I will snuggle your babies (because my cats don’t tolerate that one bit). This recipe can easily be increased for a larger portion. Heat 2 tablespoons of olive oil and a little butter, if desired, in a sauté pan over medium high heat. Sauté the mushrooms in batches with a pinch of kosher salt until they are golden brown. Remove the pan from the heat and set aside. Fill a pot with water and season with about one tablespoon of salt and bring to a boil. Fill a medium sized bowl with ice water. Add the asparagus to the boiling water and cook for one minute. Remove the asparagus (leave the water in the pot) with a slotted spoon or fine mesh sieve and immediately plunge the asparagus in the bowl of ice water. After the asparagus cools, drain and set it aside. Pour the couscous or couscous blend into the pot of boiling water and boil for 10 minutes, or until the couscous is tender. 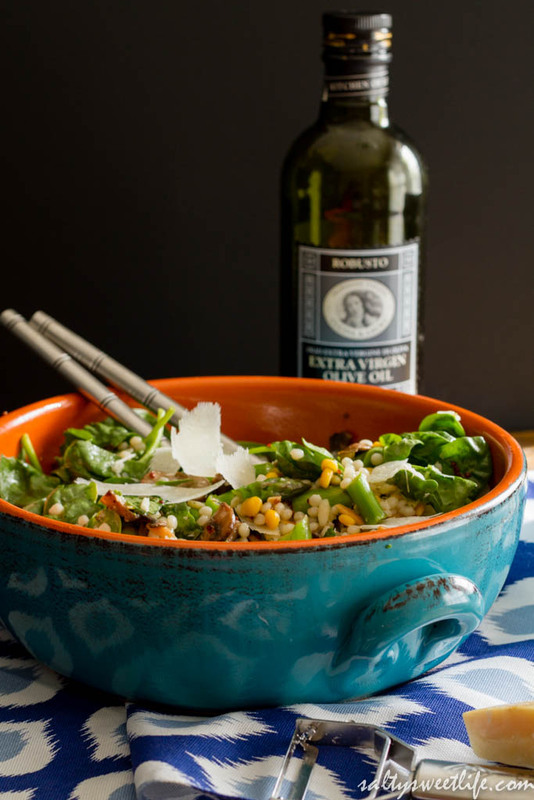 While the couscous is cooking, make the vinaigrette. Whisk together the vinegar, crushed garlic, dijon mustard, agave syrup, herb salt and a few grinds of black pepper in a small bowl. Slowly whisk in 5 tablespoons of olive oil until the mixture has emulsified and set aside. Drain the couscous into a large mesh sieve or colander and rinse with cool water. 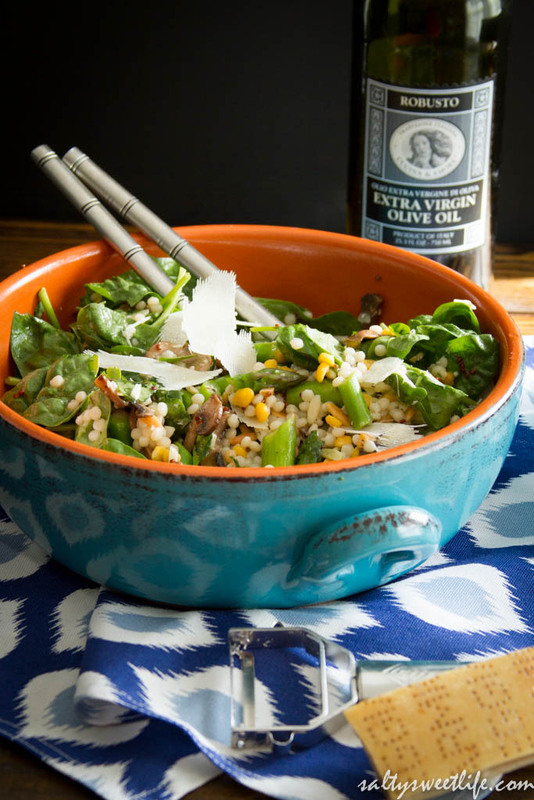 Toss the couscous with a little olive oil to keep the grains from sticking and place in a large salad bowl. Add the asparagus, mushrooms, a few handfuls of spinach and the shaved Parmesan cheese to the couscous. Add the dressing, then toss, using your hands if necessary. Garnish with more shaved Parmesan. Hi there Rosir! I’m so happy you stopped by! Great shower, you look beautiful as does your food! Thank you so much, Dana! This was a tough one to write and it literally took me days to get it done. Life, ya know. It can throw you a curve ball. I did get your email and I will get back to you on it very soon! You have been busy! I love the looks of this salad. I am hosting for friends in August, and this will be a great addition. I like offering dishes that you don’t see at every gathering. It has been a busy time! I hope you give it a go! 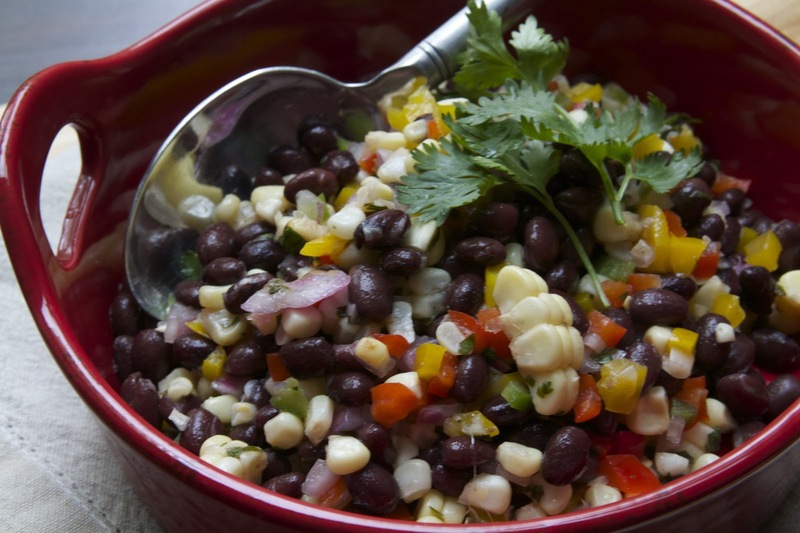 It’s a great salad and perfect for these hot days! Tracey, I was so touched to read your post… Life does through a few curve balls and we learn how to catch them… So brave of you to share something so intimate. Thank you. Thank you Melanie. I really appreciate your words and I thank you for reading this post. I’ve been meaning to re-do that pizza post since I’m using a better dough recipe, but the “fig and pig” is one of my favorites! Tracey, you are so gorgeous. And this spread couldn’t be more beautiful. Every time I read one of your posts, I admire you more. Dana said it all. I love Israeli couscous, and this salad looks divine. Yum I am so looking forward to all of your future posts re this party spread. You are amazing. Ali, thank you from the bottom of my heart! 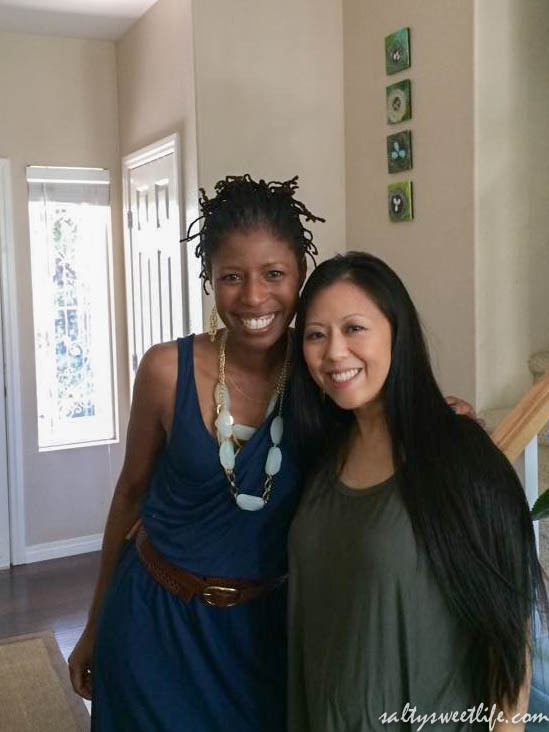 You are such an inspiration to me and I have learned so much from you! I really appreciate your kind words! Tracy! You are one strong woman! 🙂 I am so blown by your post, I cam unable anything about the recipe at all! You are so sweet, Prash. Thank you!